I haven't made a tea bread for some time and always find them to be really good value, as they get better after several days wrapped in foil. Dried apricots are once of my favourite things and as I was looking for an 'A' bake for AlphaBakes AND a bake suitable for a Village Fair, Fete or Show for the Calendar Cakes challenge, it was just the excuse I needed to make this loaf. It certainly turned out well, it's fruity, moisty and chewy, it really doesn't need any butter but you could spread some on if that's your thing. There wasn't any strong taste from the Whittards WhiteTea with Pomegranate that I used for soaking just an overall fruity flavour. 1. Put the dried fruit and sugar in a bowl and pour over the hot tea. 2. Leave it overnight to soak up the tea, but I didn't have time, so mine got 2 hours and was still pretty wet. 4. Line a 900g/2lb loaf tin with baking parchment or one of those clever loaf tin liners. 5. Add the flour, lemon zest and beaten egg and stir iwth a spoon till mixed through. 7. Leave to cool in the tin for 10 minutes then turn out onto a wire rack to cool. Peel of the baking paper or liner and serve sliced with or without butter. Alphabakes is run by Ros at The more than occasional baker and Caroline at Caroline Makes and Calendar Cakes is hosted by Rachel at Dolly Bakes and Laura at Laura Loves Cakes. You don't need to use apricots, I've made it with dates before, any dried fruit will do. I just love apricots and always have them in the house. It is super easy to make. I LOVE dried apricots. I must give this recipe a try. Thank you! this looks abolutely delicious! I have eaten a similar bread in Switerland several times that had been made with dried pears. I made the experience several times as well that many liquids won't add an intense taste when baked. Regarding (green) tea, matcha could be a solution. I never tried that myself so far, just a thought. 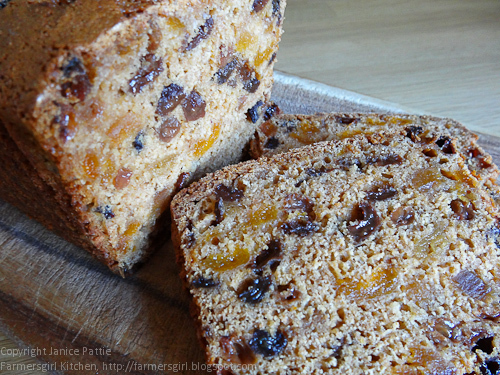 I still have some dried apricots leftover from the Nigel Slater cake I made so think this one might be on this weekends 'to do' list. It looks lovely Janice - dried apricots are delicious. Tea bread reminds me of my gran. It looks so easy to make I might try and have a go. I'm such a lazy blogger I haven't made anything new for ages but I am feeling the beginnings of inspiration! Mmm, you've reminded me that it's been too long since I last made a teabread. I love them too. I like the idea of soaking the fruits in tea before baking. Thanks for entering AlphaBakes. I'm closing my eyes, imagining a slice of this with my cup of tea of an afternoon! So gorgeous! 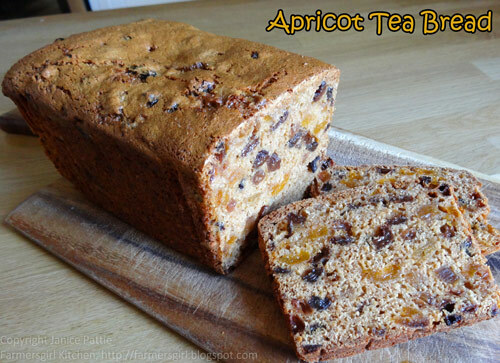 I like this apricot flavor very much that's why I also like your delicious Apricot Loaf Cake.